Only 24 Hours Left to Enter for a Chance to Win an iPad Mini! Only 24 hours left to enter The Escapist's latest community giveaway for a chance to win a FREE iPad Mini and everyone receives a free copy of Fairway Solitaire just for participating! Last week, we launched our latest giveaway, allowing one lucky winner to take home a brand new iPad Mini for the holidays, thanks to our partners and friends over at Big Fish Games. Unlike most giveaways, all participants walk away with a free copy of the full version of Fairway Solitaire just for participating. Everyone is a winner! 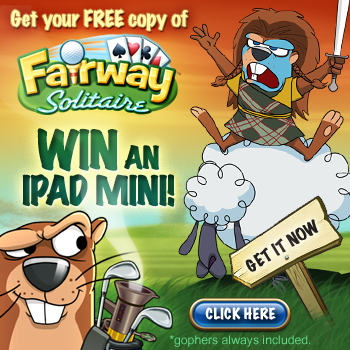 What is Fairway Solitaire and why might you care? Inspired by Caddyshack, Fairway Solitaire presents players with a modified type of solitaire game with a golf theme for your iOS device. Follow a hilariously sarcastic story of a gopher named McDivot and his seething disdain and desire to put all golfers in their place! Score the best runs by clearing the card deck using the least amount of moves. But you don't need me to convince you! Get your free version now and check it out for yourself. This event ends Tomorrow, December 15th at 12:00PM EST and is open to most residents of the US, United Kingdom, Ireland, Canada, Germany, France, Italy, Australia, and New Zealand. For all the rules of participation and how to receive the limited edition badge just for participating, click here.